Fort Pierce, FL – Looking for a weekend of fun and excitement? 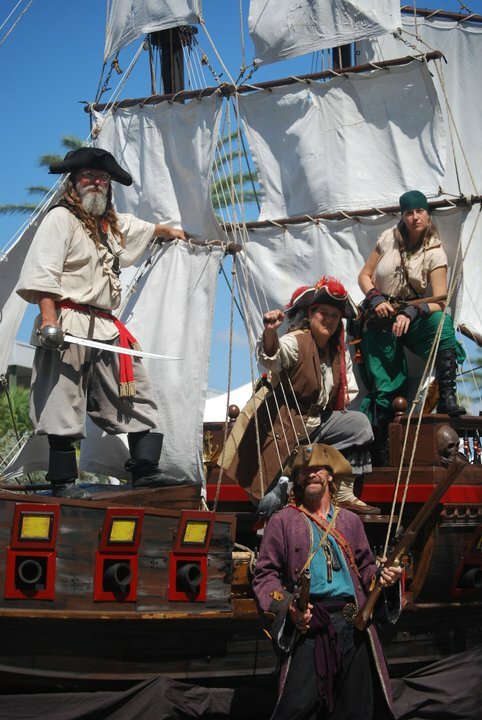 Look no further than the Treasure Coast Pirate Fest. Located at Veterans Memorial Park in historic Fort Pierce, this event draws a huge crowd each year and has been referred to by many as one of the most historically accurate pirate festivals in and around Florida. Join us this year as we celebrate the 10th year of this amazing event. Loaded with colorful rogues, wenches, and scallywags, the family friendly Treasure Coast Pirate Fest offers up some of the nation’s finest reenactors who help provide visitors with a true to life pirate encounter. This highly anticipated event is always a favorite among festival goers. Some festival high points include exploring the Living History Pirate Encampment (a firsthand look at how pirates lived ashore back in the day), and the Pirate Weapon Demonstrations with real swords, muskets and cannons! You can also meet world renowned and famous people like; Treasure Hunter “Captain Fizz” Carl Fismer, Authors Allen Balogh, Patrick S. Mesmer, and Robert Jacob and Pirate Artists Steve Witucki, and Don Maitz creator of the iconic Captain Morgan Spiced Rum Character. The scheduled lineup of live music is packed with performers such as the fun-loving Irish American band, Bawdy Boys performing Saturday and Sunday, Blarney Rubble, a high energy trio hailing from Key West performing all three days, Celtic Conundrum, with songs from Ireland, Scotland, and England performing Saturday and Sunday, The Lazy Jacks, maritime music who perform Friday only, and BAM, The Bard and Minstrel, comedy, music, and lighthearted debauchery performing Saturday and Sunday. There is also plenty for the younger pirates like the kid’s costume contest, Lord Drake’s Mystic Magic Show, Meet and greets with Real Mermaids, guided treasure hunts, the Avenger Pirate Ship, the Quest Game which is an interactive hunt for wanted pirates, and the very popular Little Buccaneer Kid’s Zone where young pirates can play all day long with the purchase of a $10 wristband. Be sure to keep an eye out for everyone’s favorite Pirate of the Caribbean, Captain Jack on Saturday and Sunday and catch an amazing show from David Ferman of America’s Got Talent fame with comedy, juggling and stunts, appearing Saturday and Sunday. Another great feature of the pirate festival is that visitors can shop more than a hundred various nautical theme and arts & craft booths and savor delicious foods and enjoy a cocktail while taking in the sights and sounds during this 3-day fun-filled event. Pirate Fest admission is free, though a $2.00 “Buck -N- Ear” voluntary contribution is greatly appreciated. That be two dollars for ye landlubbers! Non-perishable food donations will be accepted at the gates for the Treasure Coast Food Bank. A portion of the event proceeds will benefit the Scarlett Fortuna a 501(c)3 non-profit organization who work towards promoting education and reading among school age children. The Scarlet Fortuna will be featuring their Mobile Book Tent. Enter into a pirate themed tent where the only treasure pirates have to share is books, books, and BOOKS! Bring your children by, receive a book free of charge (while supplies last), donate gently used or new children’s books, or even swap them! The greatest treasure in the world is knowing how to read. The 10th Annual Treasure Coast Pirate Festival is sponsored in part by POTTC Events, Pirates of the Treasure Coast, Southern Eagle Distributing, Corona Light, Professional Concessions Inc., Florida Window and Door, Teleperformance, Milano Bail Bonds, Giant Recreation World, City of Fort Pierce, Hometown News, B94.7 Fresh Country, 99.7 Jack FM, Pirate Radio of the Treasure Coast, Coast 101.3, Wave 92.7, Oldies 103.7, Treasure Coast.com, Macaroni Kid Port Saint Lucie, Treasures of Fort Pierce, Bones Rum, Sampson Tree Company, Fink Golf Cars, The Original Bagel Brothers, and the Official Rum Sponsor – Brinley Gold Shipwreck Rum.